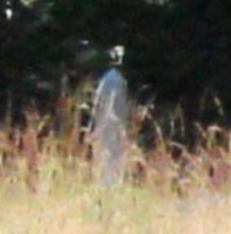 Captured a ghostly spirit while taking random pics of The Wheatfield in Gettysburg, PA the weekend of September 18-20, 2009. Didn't see anything when I was taking the shots, only after I transferred them to my pc did I even notice him, and I had to enlarge it to see it clearly. I'd venture to say he looks more like a "cadet" than a Civil War soldier. But, I finally got one! Okay, that might actually be a statue. I've never gotten to go to Gettysburg YET, so I can't say for sure. BUT, just looking at the photo, I see at least two faces. One on each side of the ghost, or statue. The one on the left is really large, his head is thrown back, and mouth open. Perhaps a look of agony. It's a good shot even without the center figure. First off, if this is posted a fake, then the person doing the "faking" should be ashamed of themselves. Why disrespect these Civil War Heroes? I am a firm believer and I would hope you would not present this picture as real while it is a hoax. Spirits are real to and until someone proves me otherwise, I am a believer. You captured his spirit so vividly!! Awesome!! I've studied the civil war in high school for all four years now, and i no for fact that Union soldiers wore that exact type of uniform, the picture looks as though it is a Union soldier that died at the battle. Great Picture! I looked at this picture closely. The out of focus feature is (in reality) the Zook monument, not a "ghostly" figure. Anyone can make a mistake identifying something like this. I do find it curious that the monument is so out of focus, but you can adjust your camera for a focal point, which will throw "out of focus" items in the photograph, either in front of or behind the focal point. Brenda was right in her evaluation. Why are you on this site if you don't believe in ghosts? GettysburgGuide...I can assure you I am not a "ghost hunter, merely an amateur photographer and Civil War History buff who visits Gettysburg every year in September. I have the utmost respect and reverence for those who gave the ultimate sacrifice and would not desecrate these hallowed grounds under any circumstances. Taking pictures is not disrespecful. I can also verify that the image in the photo is NOT the Zook monument. I wasn't anywhere near it, and didn't walk but a few feet up the small path, after I parked near the Wheatfield sign. I walked to the top of the hill and took some random shots, and left quietly. The "ghost" appears out of focus because he's transparent. I agree with you. It does get a bit hard to take when people make something out of nothing. It gets almost silly. And I agree with the disrespect part, as well. I'm going through this site as we speak and I'm cleaning up comments and try to withhold things from going live that are obviously not paranormal. But what I'm also tired of around here is the tone of voice people are using. So your's is the last post I'm accepting on this site that has any ounce of discourtesy to anyone else. All the slamming and ranting and raving makes my job unenjoyable. I am doing my best to improve quality and weeding things out on the front end. You guys could please help by starting to be civil to one another. I've been trying to be transparent, but it is becoming detrimental to the site. From here on out, I'm deleting any and all discourtesy. If you want anger and rudeness, there are plenty of other sites out there to choose from. I have spent time on the battlefield and have yet to see a real ghost. I've seen ghost hunters desecrating hallowed ground by snapping photo after photo of nothing in particular, hoping to capture some fuzzy outline that they can call a ghost. I feel you are disrespectful and here for all the wrong reasons, and you need to start being a little more respectful to those who fought and to those who come to the battlefield for the right reasons: to study the battle, enjoy the history, and extend their respect. Please come here for the right reasons. To the person whose only reasoning for dismissing the photo is "because ghosts are not real" have an open mind. Yes, the photo could just have a "smudge" in the film to make that image look ghostly, it happens. Who knows what that really is? Many people have seen ghosts. I have not only seen them but HEARD them. I collect EVP from local areas where I live. I even have my own haunting which I quite like having. Have an open mind and respect what people say. If someone believes they saw something, then take it with a grain of salt. Don't be so rude. How is this fake? This is 100% real. Maybe you people should freaking go look up the battle of Gettysburg! It looked cool but I know it's fake because ghosts are not real. This is fabulous! I have been going to Gettysburg for years and have captured and seen many many things myself. I actually just submitted a picture just today that I took over the summer at Sachs Bridge. John, I agree. I too was skeptical until I captured unexplained images on camera. This tells me that the spirits of Civil War Soldiers are still lingering there as they were in 1863. The big question is why after all these years they're reliving events from the era. I got many unusual photos, but some are not as evident as The Wheatfield Ghost. Too bad you didn't have your camera handy when you heard the ghost...by the way, how did you determine he was a Lt. Col.? Somewhat skeptical person but Gettysburg changed that. One night while walking with my daughter heard voices talking about what turned out to be a very obscure lt. col - when I looked over a wall to see who was talking - nobody there. Also walking across the low ground on Cemetery Ridge just before Little Round Top in full sun heard a pop - turned and saw a shadow by the trees which then moved back into the treeline. I don't know what else it could have been. Thanks, Lisa for your positive comments. Your experience is why I chose to take pics in daylight, so you can see what's there, not just hear it. I've never been the battlefield at night...way too scary!(smile). In any event, I hope next time you're able to capture at least one of many Gettysburg Ghosts. Thanks for sharing the photo. It's a great pic! My husband and I were at the Wheatfield just last night. We heard foot steps alot and even saw a black figure, but I couldn't get a good shot because it kept appearing and disappearing. I'm glad you were able to capture what we have been unable to capture. Thanks again! I'm sure Gettysburg's battlefields are "scary" at night, but I got most of my unexplained ghosts during the daylight hours. The spirits are there, regardless of whether the sun is shining or not. Frankly, I'd be hesitant to walk on the fields at night...I prefer to be able to see where I'm going and where I've been. Have to say, Gettysburg is one of the creepiest places I have been. I love going there, however, the fields are so eerie. If you ever get the chance to be on the battle grounds either at dusk or at dawn, it is extremely scary. Thanks for the pic. Thanks, Shawn for your positive comments on my Wheatfield photo. I commented on your photo recently and confirmed that I believed something paranormal was going as evidenced by the weird lights and orange mist. It's too bad these restless spirits can't move on, but it seems they've chosen to stay in our realm for whatever reason or perhaps they're stuck in this dimension. Good for ghost hunters like us, though, huh? Wow, what a great photo! I know how it feels to go over the film and see you caught something. Very cool, check out ny photo, "Possible paranormal presence in photo", and tell me what you think.